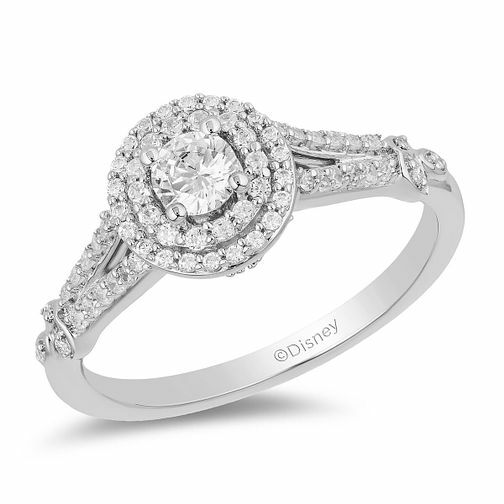 This captivating diamond ring, as part of the Enchanted Disney Fine Jewelry collection, presents a flawless display of dazzling diamonds inspired by princess Tiana. A chic round centrepiece is complimented with a divine double halo, set with shimmering stones, carried onto the intricate shoulders. The band is finished either side with trios of leaf shaped frames set with further dainty diamonds, and the Disney signature engraved upon the inside. This ring presents a total diamond weight of 0.50ct.